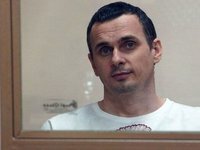 Ukrainian filmmaker Oleh Sentsov, who had been convicted for terrorism and is serving his sentence in Russia, has been receiving supportive treatment, his lawyer Dmitry Dinze said. "Oleh Sentsov is in stable condition now, I checked today. He has actually been receiving supportive treatment. I will be able to find out what this treatment entails on June 4, when I visit Oleh," he said on his Facebook account on Tuesday. Officials of the Russian Federal Penitentiary Service cannot clarify anything, because "the medical unit of the colony," where Sentsov is being held, "administers treatment," he said. "I cannot give further clarification," the lawyer said. On May 16, Sentsov went on a hunger strike demanding that all Ukrainian citizens in custody in Russia be released.